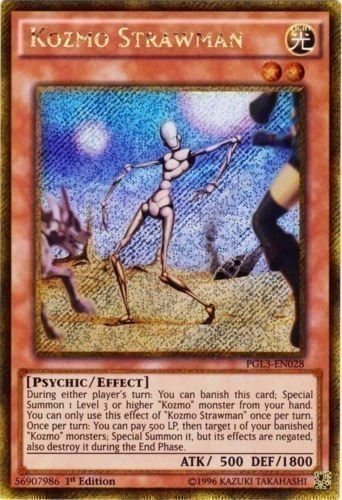 Text During either player's turn: You can banish this card; Special Summon 1 Level 3 or higher "Kozmo" monster from your hand. You can only use this effect of "Kozmo Strawman" once per turn. Once per turn: You can pay 500 LP, then target 1 of your banished "Kozmo" monsters; Special Summon it, but its effects are negated, also destroy it during the End Phase.